The columns component can be used to display unique or repeating information backed by a row and column model in a dataTable. Basically by linking the front end columns component directly to a bean level model, the developer has greater control over the contents of their tables. 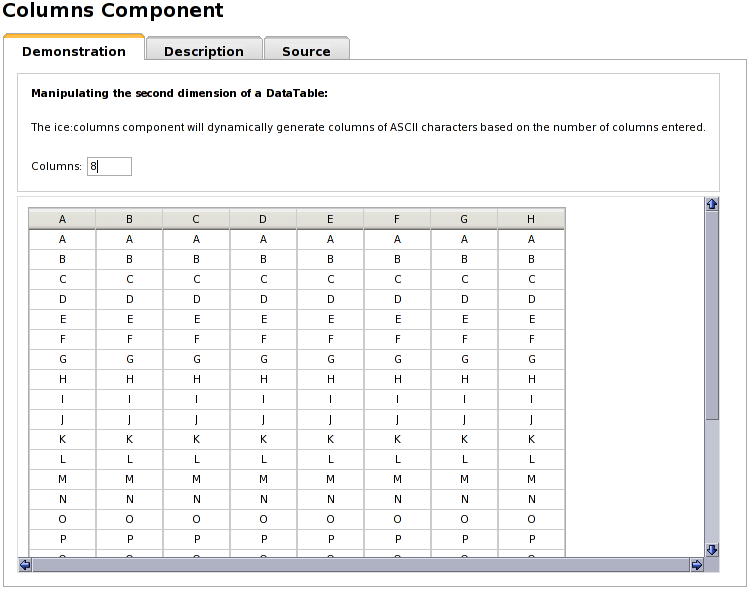 The columns component can be used as a replacement for the standard h:column child of a standard dataTable. The following screenshot is of the ice:columns component demo in the component-showcase. Notice the ability to increase or decrease the number of columns displayed. To use the full potential of the columns component, a DataModel for the rows and columns should be specified in a backing bean. Through the DataModels, the developer can specify the information that will be present in the table. The creation of a basic columns component with custom non-changing data is a simple 3 step process. In this next example the page contains a numbered list of repeating Odd and Even values. As you can see, the row DataModel is assigned to the parent dataTable, and the columns DataModel as a value of the ice:columns component. By using a var declaration, we can output the current value of the DataModel as the component is iterated through during the rendering process. Download the columns-basic source code here. The DataModels used in the backing are simple to create, and the next tutorial will demonstrate calculating page level information from the status of the backend objects. The above method will use the current row and column DataModel to retrieve the support information for that index. Basically we get the current row, ensure it is available (which means the page has loaded it, the component is rendered, etc. ), and then do the same for the column. With the combined row / column data, we can check the support info string and return a proper result to the page. Download the columns-cross source code here. So far the examples use static data that does not change one generated. The next tutorial will detail how columns data can be updated from the backend. Then the method called from this page level commandButton will need to be added to the backing bean. The goal of the button was to force the data in the columns component to update, and so the next() method will simply increase an integer (which will later be added to the page so the changes can be seen). The end result is that when the user presses the 'Update' button, the next() method is called, which updates an integer. The changed value is automatically displayed as the contents of a column component. Using this basic understanding, it's possible for a developer to update statistics from a real time persistence layer, etc. Download the columns-update source code here. As was shown, updating the data contents of a columns component was simple. But a developer may also wish to modify the attributes of the columns on the fly, which will be demonstrated in the next example. Due to the coupling of a flexible DataModel and powerful front end columns component, a developer has the option to dynamically modify not only the contents of the table, but also the attributes of the component. To demonstrate this, we will look in detail at allowing the user to increase or decrease the number of columns present on the page. int columnValue = (event.getNewValue() != null ? Basically, we take the newly updated numberOfColumns variable and recreate the columns DataModel, with numbers inserted for each line of header text. You may have noticed a very nice benefit of using the columns component in this way is that the backend is all that needs to be modified, the page level component itself hasn't changed much beyond the first example. This makes the many available changes to the DataModel a useful option to avoid having to update several pages. Download the columns-dynamic source code here. Component Showcase Available in release bundles Columns example which with alphabetical data in a dynamically sizeable columns based table. columns-basic columns-basic source code Simple example of how to setup a basic hard coded columns component. columns-cross columns-cross source code Example showing how to insert custom on the fly data into a columns component. columns-dynamic columns-dynamic source code Demonstration of how the size and number of columns can be dynamic modified. columns-update columns-update source code This example shows how the data inside a columns component can be updated to reflect user initiated changes.